Run for Mom....run for me! I’m not an early Saturday morning person. Friday nights are usually packed with crumbcatchers’ activities – plus last night, my husband and I did our usual "Friday date night", watched a movie OnDemand, sipped Margarita, munched on chips and salsa and ended the night with brownies ala mode. However, this morning around 7:30am, my friend text’d me and asked if we’re running the “Run for Mom 5K Run” (www.CancerCare.org). My reflexes replied, “no”, but then just a few nudge and I finally convinced myself that it would be nice to do it! 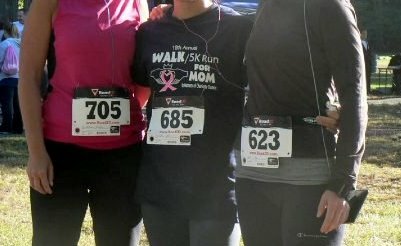 It’s for a great cause, but mostly it’ll be my first ever race! Sometimes you need a friend to give you that push! And I was so glad, she did! My friend and I have been training to run for our 5 mile run in November (whether we will actually do it or not still remains to be seen!). 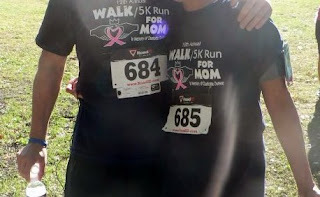 ﻿In 30 minutes (more or less), along with our friends, my husband and I ran our first official 5K run (3.2 miles) – and we were not even running out of breath! It was one gorgeous Saturday morning! Great weather, great cause, and great company! 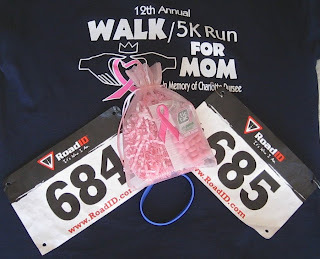 So even though the run was intended to benefit breast cancer programs, I totally benefited from it! The Big C has affected a lot of families including my own. My mom had a full hysterectomy a few years ago, my sister-in-law had a mastectomy a few months ago, a couple of my family friend’s parents are undergoing chemo treatments, and a cousin has just been diagnosed with throat cancer. And from all these experiences, there’s no better cure than the unwavering support and prayers from family and friends. You, too, can make a difference. Now through November 24th, please visit the TicTac USA Facebook page to share how you have helped someone affected by cancer and TicTac will donate an additional $5 per unique user (up to an additional $100,000 to CancerCare! ) So please visit www.facebook.com/tictacusa . ﻿Lastly, we all have aspirations. We all have dreams. We all want to branch out to reach for that star! One thing I learned: It is not enough that you dream of something. Have a great week(end), everyone. 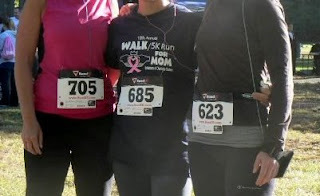 On Nov 2010, my friends and I ran 5 miles at the Beauty and the Beach 5 mile run. My pace was 10:05.
good for you jenjen. the pull of the bed on saturday morning is hard to fight. WAY AND S = WAY TO GO AND YOU SUCCEEDED! I AM VERY PROUD OF YOU. Yay for Jen! How I wish I could be running with you! Because of my back problem running is forbidden to me and walking very far is difficult (hopefully better after my next surgery). Cancer, and breast cancer specifically, is very personal for me and my family too (http://feliciakramer.blogspot.com/2010/09/roses-for-my-mother-and-breast-cancer.html) so I do what I can do with my art. @Deborah, one to-do off my bucket list, hurray! @modernMom, I didn't think I could do it either. @Felicia, can't wait to walk with you, too. Feel better my dear and you know I'm a fan of your artwork! I wish I can capture life the way you do.